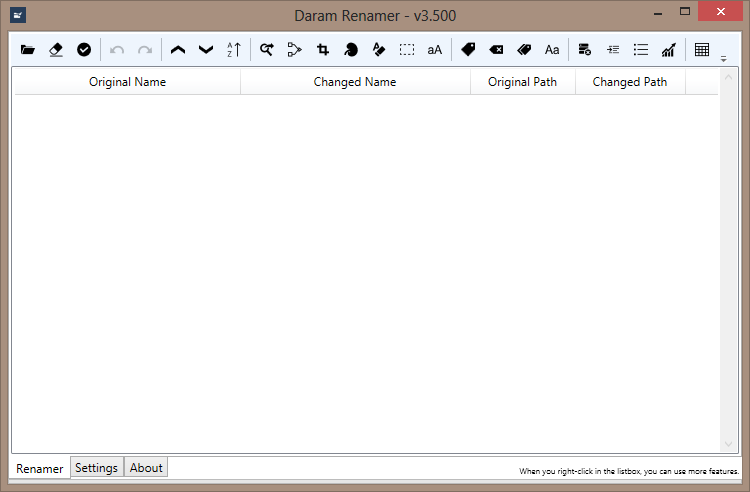 A couple of days ago I came upon another free and open source file renamer- Daram Renamer, which turned out to be a capable, easy to use and well-designed program. 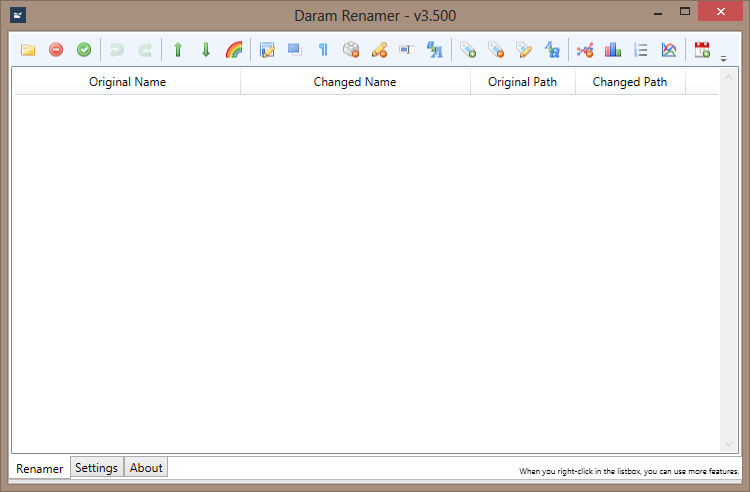 Daram Renamer is a batch file rename tool which supports many renaming options. Daram Renamer is portable by design- settings are saved in JSON file (DaramRenamer.config.json) inside program folder. 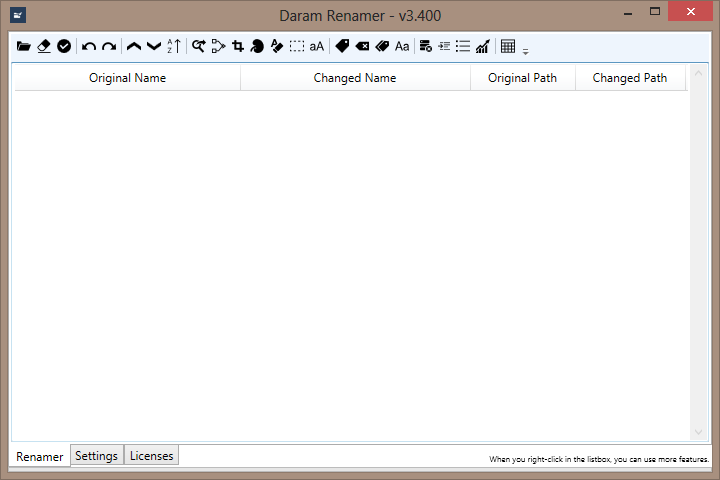 Daram Renamer requires .NET Framework 4.6 and can run on Windows 7 or higher. Daram Renamer is licensed under MIT License. Until version 3.200 Daram Renamer used a nice icon set- Silk Icons but from version 3.300 the program uses a dull, monochrome icon set- Syncfusion Metro Studio Icons which is a pain for my eyes so I used version 3.200 for tests. I opened an issue requesting an option to use the old toolbar icon set but it was rejected by the developer. For me the new toolbar icons are unbearable so I do not plan to update version 3.200. Update check cannot be disabled in settings. Daram Renamer uses about 60 MB of RAM on my machine (Windows 8 x64). I also prefer the colored toolbar. In general, I don't see a reason to give up on functional designs in favor of fads that waste space - like the ribbon - or "stylish" monochromes that keep me guessing and searching. It's not distraction-free if I have to shift my attention to cryptic buttons or cluttered ribbons. The classic, customizable toolbar is still my favorite. 2. Do Not unzip this icon pack. Just copy to same directory of Daram Renamer. 3. Open DaramRenamer.config.json, and Edit "toolbar_icon_pack" element from null or other to "famfamfam_silk_icon". I would like to thank again the developer- Jin Jae-yeon, for allowing the users to use the old toolbar icon set with the new versions of Daram Renamer! M$ is waging a war on colour and gradients and unfortunately many developers join the anti-colour movement. I cannot stand the dull flat style which has also conquered the web. Ribbon interface is a disaster- it is not just ugly and inconvenient, it is also a huge waste of space. I refuse to use programs with ribbon interface no matter how good they might be. I cannot stand the dull flat style which has also conquered the web. Ribbon interface is a disaster- it is not just ugly and inconvenient, it is also a huge waste of space. I refuse to use programs with ribbon interface no matter how good they might be. I couldn't agree more. Dissatisfied users galore, although not everyone speaks up about it. I also avoid the ribbon as much as I possibly can. Efficiency is WAY better with custom tooolbars and "tear-off" submenus that can be made sticky and placed anywhere on screen. The dull look has gone so far in some apps that dialogs don't sport buttons anymore. You have to scan the clutter of text and captions to spot words like Ok or Cancel or Apply. Thanks for your guidelines how to change the TB-look. I will also thank the developer for bringing the color back. The developer does not provide official change log, I tried to build it from here. Since version 3.700 Daram Renamer requires .NET Framework 4.7.2 and since it cannot be installed under Windows 8 I discontinue the testing of this program and I will never add it to the database. As of today (2018-11-08) the latest version of the program is 3.740 (from 2018-09-21). Incidentally, that is a sreenshot of ASoft .NET Version Detector (http://www.asoft.be/prod_netver.html), a no-install DotNET utility itself, which not only detects versions installed but will also allow the user to download any other still available. 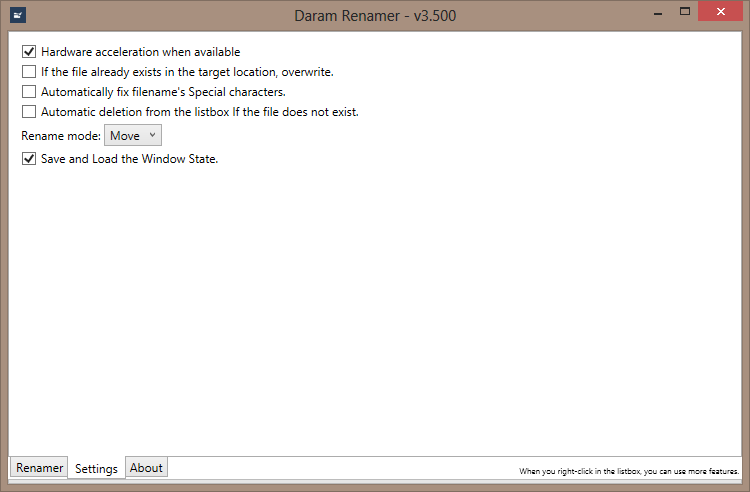 Windows users who use a firewall with strict rules, in particular a rule that blocks new connections, may notice that Daram Renamer won't start under that configuration. The error log highlights that the program attempts to establish a connection. The issue can be resolved by allowing the program to connect to the Internet. Users who don't want this can add the listed IP address in the error log to the hosts file to redirect it to localhost. WTF? What a dumb hoop you need to jump to use this, no thanks when there are already tons of "Renamer" programs out there to choose from. Please notice that I wrote Windows 8, not Windows 7, not Windows 8.1- there is a difference between Windows 8 and Windows 8.1 and .NET Framework 4.7.2 cannot be installed under Windows 8. When I first came upon that program I found it promising and the developer- co-operative, however it later turned out that he was one of these modern developers who is stingy to include 8 KB license file in the archive (in the comments section of the article you mentioned above someone explained that the program requires internet connection to download the license file, which for me is really dull) (the 15 KB alternative tool bar icons archive is also not included) yet harsh to set so severe a requirement (.NET Framework 4.7.2+). 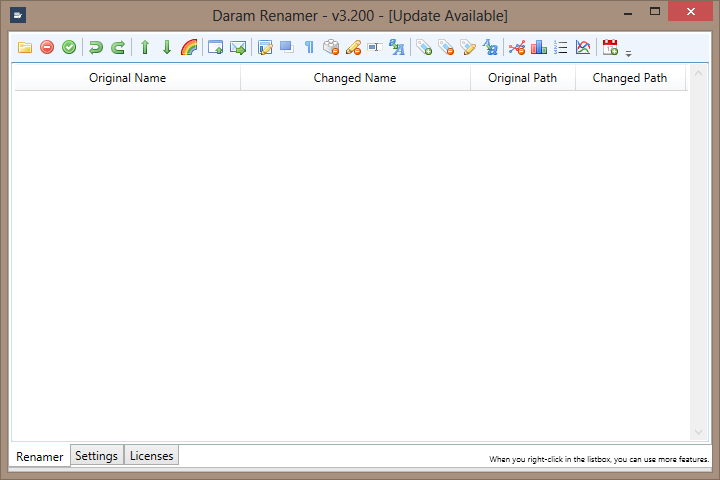 Until now while testing programs I have not checked whether they try to establish internet connections but I did notice that Daram Renamer downloaded the license file (DaramRenamer.License.txt) yet it did not occur to me that I should mention that in the review. I also forgot to point out that update check cannot be disabled and this is totally wrong. 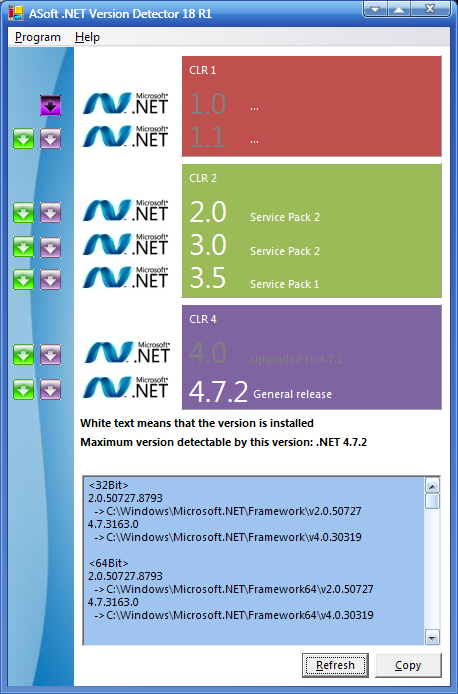 As I have previously mentioned for me the new tool bar icons set is horrible but this can be cured while the new requirement (.NET Framework 4.7.2+) is incurable. smaragdus wrote: ↑ Please notice that I wrote Windows 8, not Windows 7, not Windows 8.1- there is a difference between Windows 8 and Windows 8.1 and .NET Framework 4.7.2 cannot be installed under Windows 8. I stand enlightened. But just out of curiosity and if you don't mind, I was convinced that 8.1 was the better version of the 8th Windows iteration. Have you any reason to contradict that?